Spartacus Gym offers Kickboxing and Brazilian Jiu Jitsu classes featuring a specialized curriculum designed especially for the beginner. We value authenticity, technique, and progress in a co-ed environment. To maintain the best possible student to instructor ratio, classes are capped at 16 students for each Kickboxing class and 10 students for each Brazilian Jiu Jitsu class. Everyone at Spartacus receives plenty of individual attention and personalized coaching. At Spartacus Gym, men and women train together to help prepare each other for battle in a safe and supportive environment. The training is intense and demanding but if you get knocked down, we will always pick you up. 3. Sport competition & street self-defence applications are covered. No paper tigers, participation ribbons, or self-delusion at Spartacus. Training at Spartacus means that you will be challenged and tested. The mission is to know yourself and embark on a personal journey of self-discovery through martial arts. Promoting an environment where technical development is the number one priority is of utmost importance to us. Instead of open-sparring, we focus mainly on in-depth technical break-downs and situational sparring drills to simulate different types of practical scenarios that one would encounter in a real fight. Students are progressed in a methodical, systematic way until eventually, our fighters gain an appreciation of technique, timing, and strategy over aggression and brute force. Spartacus Gym head instructor Roy Duquette has over 20 years of full-contact martial arts experience training with multiple world champions in a wide variety of disciplines. Roy has competed in Muay Thai, Mixed Martial Arts (MMA), Pankration, Submission Wrestling, and Brazilian Jiu Jitsu with thousands of hours of experience as a sparring partner for professional fighters from North America, Asia, South America, and Europe. 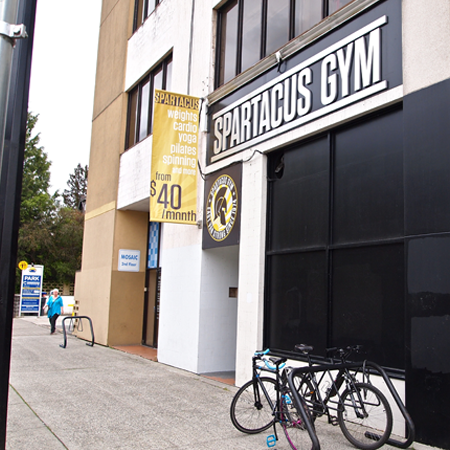 Kickboxing is $90/month or $50/month for Spartacus Gym members. Brazilian Jiu Jitsu is $100/month or $60/month for Spartacus Gym members. You can train both disciplines with an all-inclusive Gold membership for $120/month. Can I drop in for classes? Yes. A Kickboxing drop-in is $20 for a class for non-members or $10 for Spartacus Gym members. Brazilian Jiu Jitsu is $25 for a class for non-members or $15 for Spartacus Gym members. For Kickboxing: hand wraps, gloves. If you plan on participating in the sparring classes, you will need: i) a mouthguard, ii) 16oz gloves, iii) groin protector, iv) shin pads, and v) head gear.